GARRET MEADE PHOTO | Gavin Dibble shot 14 of 17 from the field, knocked down a school record 10 3-point shots and scored a career-high 39 points for Greenport. The Greenport boys basketball team didn’t grab a league championship, but it does have a new individual record for the most 3-point field goals in a game. Greenport’s bid for a share of the Suffolk County League VIII title on Wednesday night became an afterthought thanks to a phenomenal shooting display by Gavin Dibble. The Greenport sophomore guard knocked down one 3-point shot after another with astounding accuracy, and a school record that had stood for 23 years finally fell. Dibble stroked a Greenport record 10 3-pointers and rang up a career-high 39 points as the Porters whipped visiting Shelter Island by 51 points, 81-30, on the final night of the regular season. Dibble eclipsed the previous record of eight treys that Ev Corwin set in a game against Hampton Bays in 1989, eight years before Dibble was born. Corwin, one of Greenport’s assistant coaches, watched from the bench as Dibble toppled his record. Afterward, Corwin shook Dibble’s hand and congratulated him. Dibble had five 3-pointers and 19 points by halftime, but his work was not nearly completed. By the time it was all over, he had played the game of his young life, shooting a sizzling 14 of 17 from the field. He also had 7 assists, 7 rebounds and 4 steals. GARRET MEADE PHOTO | Matt Dibble of Greenport preparing to shoot while Shelter Island's Nathan Mundy (10) and Hunter Starzee (20) defend. With four minutes to go in the game, Edwards tried to substitute Matt Dibble for Gavin Dibble, but Matt Dibble opted to sit out in order that his hot-shooting brother could continue playing. When the game ended, Gavin Dibble raised a fist in the air and was hugged by teammates. Fans congratulated him, and one teammate asked him to sign one of his sneakers. Gavin Dibble delighted the home crowd with each 3-pointer that he drilled. He broke Corwin’s record early in the fourth quarter after receiving a pass from Ted Stevens. Charters, who played in his final game in Greenport’s gym along with the team’s other senior, Mike Reed, turned in a good game with 13 points, hitting 5 of 9 attempts from the field as well as a free throw. But Gavin Dibble stole the show. Gavin Dibble’s previous single-game bests were four threes and 26 points. Following the euphoria, though, there was disappointment for the Porters. In order to clinch a tie for the league title along with The Stony Brook School (11-6, 11-3), Greenport (12-6, 10-4) needed Stony Brook to lose to Bridgehampton (7-11, 7-7) on Wednesday night. The result of that game was not known before Edwards and his players left the gym. Later, their hearts must have sank when the final score flashed across the TV screen: Stony Brook 50, Bridgehampton 34. A 4-point loss to Shelter Island last month ended up costing Greenport a league crown, but the Porters enjoyed some payback on Wednesday. “We wanted to prove a point tonight that we shouldn’t have lost that night,” said Charters. A volunteer assistant, Jim Colligan, coached Shelter Island (4-13, 3-11) in the absence of its coach, Michael Mundy, who was out with cellulitis. Colligan couldn’t have liked what he saw from start to finish. 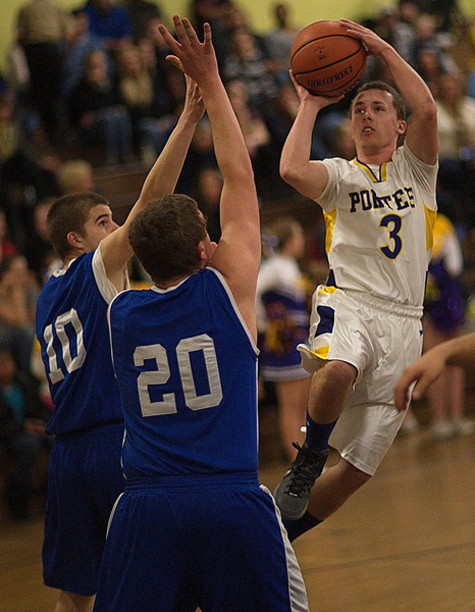 Gavin Dibble scored 7 points in the first quarter as the Porters jumped out to a 12-point lead. The lead grew and grew. It was 42-8 after a foul shot by Reed with 1 minute 32 seconds left in the second quarter. Nineteen seconds later the Indians finally reached double figures on a pair of free throws by Nathan Mundy. Matt Belt-Cappellino was Shelter Island’s leading scorer with 10 points. Greenport shot 55.2 percent from the field and was even deadlier from 3-point range (no small thanks to Gavin Dibble) where it went 14 of 24 (58.3 percent). 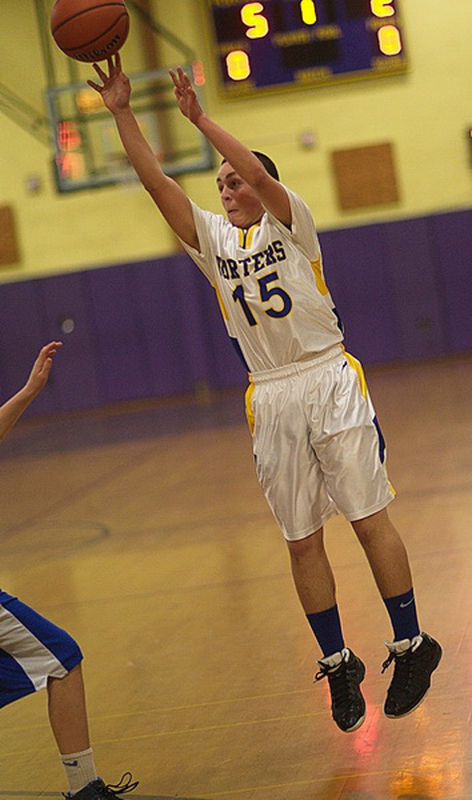 Some tough defense by Greenport held Shelter Island to 20.5-percent field-goal shooting. It will be remembered as the night that Gavin Dibble shot the lights out and entered his name in the Greenport record book. Street Talk: What are your plans for winter recess?